This year's events for the Manhattan Cocktail Classic were absolutely fantastic. All of them were well curated, had an interesting educational component, and most importantly, had delicious craft cocktails. 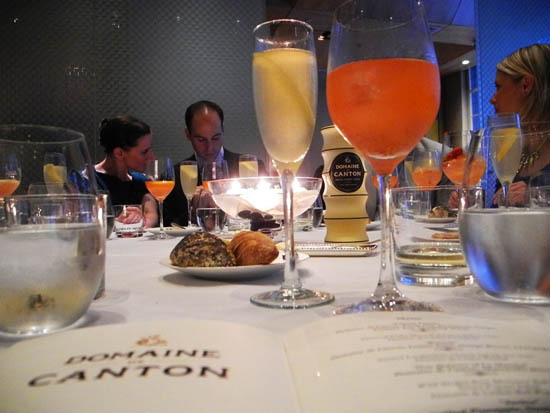 One of the gems of the week was the Domaine de Canton dinner at the renowned restaurant, Le Bernardin with chef Eric Ripert and cocktail legend, Simon Ford. 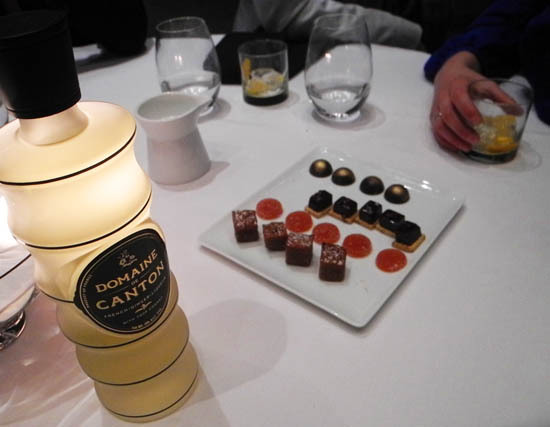 I was absolutely thrilled to be invited to the six-course dinner, a coveted seat at what was to be a gorgeous meal designed to showcase Domaine de Canton versatility in both drink and dish. 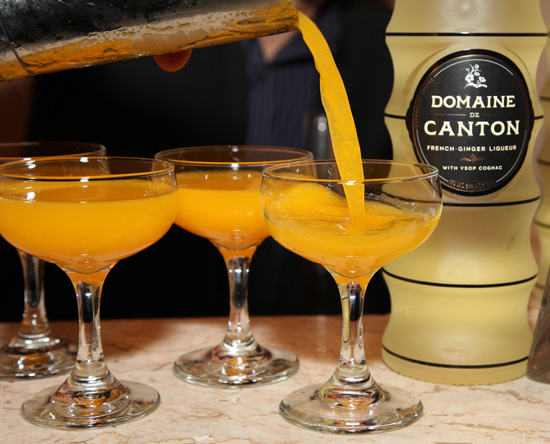 So what is Domaine de Canton, you ask? It is a cognac based ginger liqueur that is based on a centuries old recipe from old Canton for the rulers of the Qing dynasty. 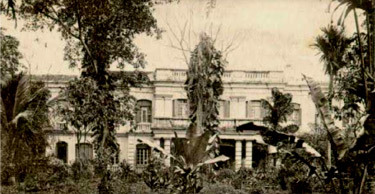 Ginger-infused cognac was first made in 19th century colonial Indochina by a Frenchman who owned ginger estate called Domaine de Canton. He experimented with the infusions, which became extremely popular with the social elite, and soon was a ubiquitous libation at the grand and exotic fetes of the colonists. Today, spirit is made in Jarnac, near the Cognac region in France, and is made by 3rd generation liqueur maker John Cooper and master distiller Jean Francois Bardou. It is a small-batch, ginger liqueur that is made from baby Vietnamese ginger, a selection of herbs and spices, VSOP Cognac, and XO Grand Champagne Cognac. The ginger infused cognac is double distilled, and then aged in French oak barrels before being blended with Tahitian vanilla beans, orange blossom honey from Provence, and Tunisian ginseng, and finally cold filtered before bottling. The product is totally natural, there are no preservatives or coloring in the product, and all of the ginger is cut and peeled by hand. Canton has been in my liquor cabinet for years now, a longstanding favorite, especially in Dark 'n' Stormies. 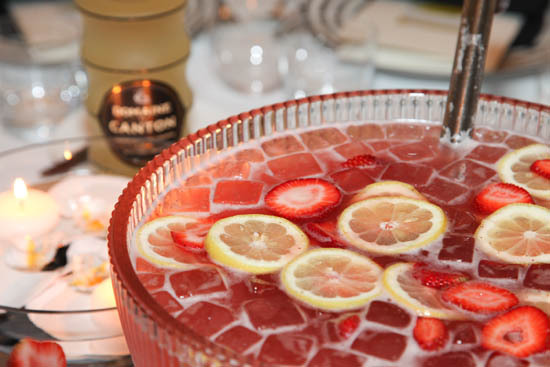 The evening started out with a gorgeous Bonsoir Punch with Canton, Ford's gin, strawberry puree, ginger puree, lemon verbena tea, and sparkling water served in large wine goblets with ice and slices of lemon and orange. The first dish was Fluke served with Micro Water Cress, Baby Carrots, and Domaine de Canton Vinaigrette, paired with a Lemon, Canton Champagne Cocktail. 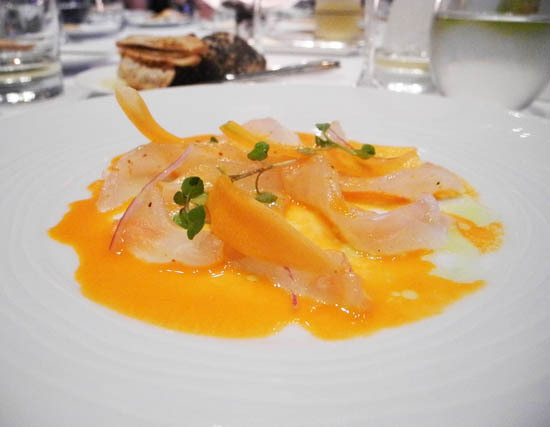 The fluke was light, almost airy, and the vinaigrette, bright with flavors of fruit and spice. 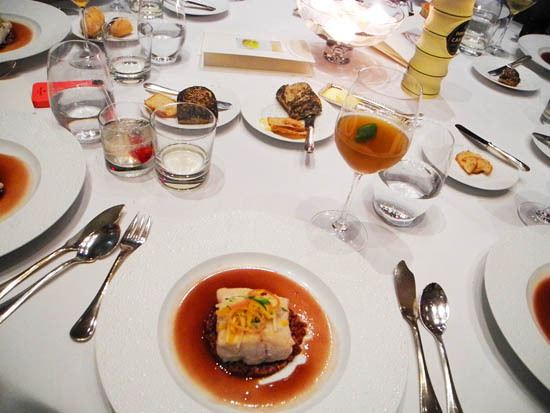 I knew that the bespoke menu was to be designed by chef Ripert, but did not expect for him to introduce each dish with a personal story about his travels in Vietnam where the Canton ginger is grown, and the reasoning behind his selection of particular ingredients like Chayote Squash or Bhutanese Red Rice. 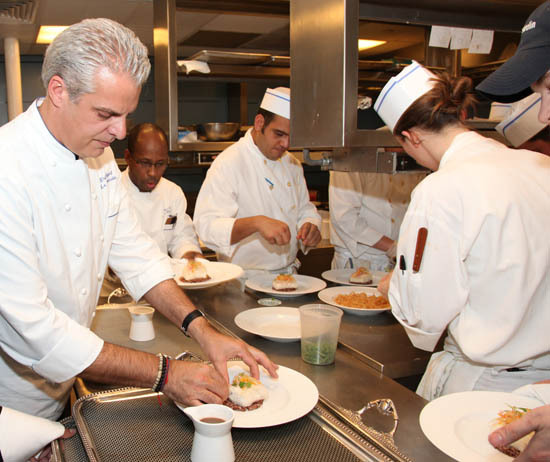 Chef Ripert is not only eloquent, but extremely charming. All of the ladies swooned when chef Ripert came into the private dining room, listening eagerly as he described the different flavor combinations and ingredients. 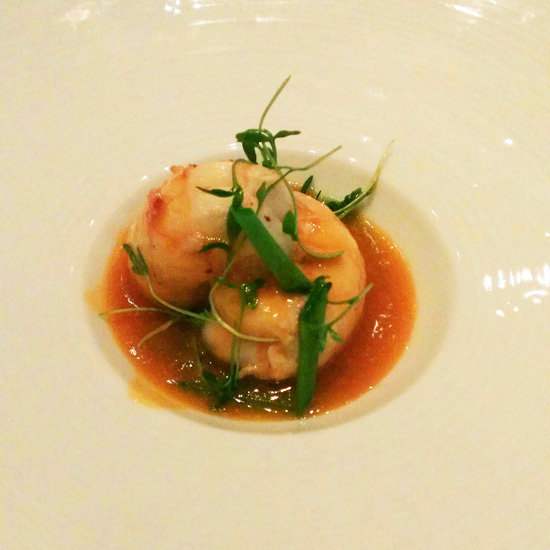 The second dish, Sauteed Langoustine, Chayote Squash, Sea Beans, and Domaine de Canton Sambal, paired with a Ginger Sherry Cobbler. This dish was one of my favorite dishes of the evening; the Langoustine was sweet like it's North American brother the Lobster, perfectly balanced with the spicy sweet from the ginger, the baritone of the Chayote, and the extra hot kick in the sauce from the chili paste. Then, to a gorgeous piece of Wild Striped Bass, Served with Bhutanese Rice, Green Papaya Salad, and a Domaine de Canton Red Wine Sauce. This was served with a stunning cocktail of Canton, Cana Brava Rum, Banyuls Vinegar Shrub, cooked Pineapple Juice, and topped with soda. 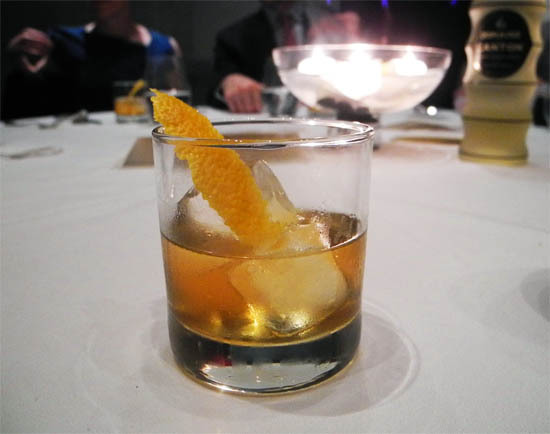 This cocktail was one of the favorites of the evening - guests swooned over this tipple (and many ordered a second). The Bass was equally as delightful, although I was most intrigued with the Bhutanese Rice - which had such a nice flavor of toasted walnuts. 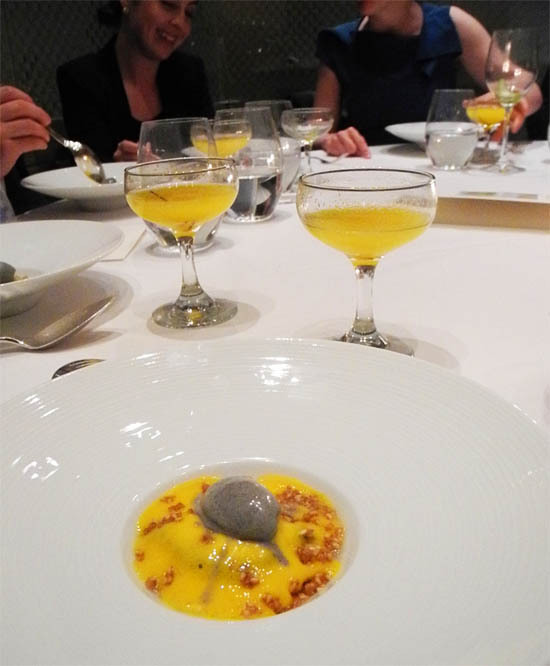 Two, yes two desserts were served (what decadence, we say), the first of which was a lovely trio of Macerated Mango, Black Sesame Meringue, and Domaine de Canton Sorbet. (Note to self: make Domaine de Canton sorbet). Again, the chefs prepared a dish that balanced the spicy sweet flavors of the ginger liqueur against a nutty flavor of the black sesame. The cocktail pairing for the fourth course was another of my favorites, made with Canton, Tequila Cabeza, Mango Puree, Agave, Fresh Lime Juice, and Grated Dark Chocolate slivers floating on top. Not only were these cocktails incredibly lovely to look at, but they were savory, sweet, and spicy. I loved the surprise of the chocolate notes in this cocktail, a nice, subtle bitter flavor to balance out all the big flavors of mango and ginger. 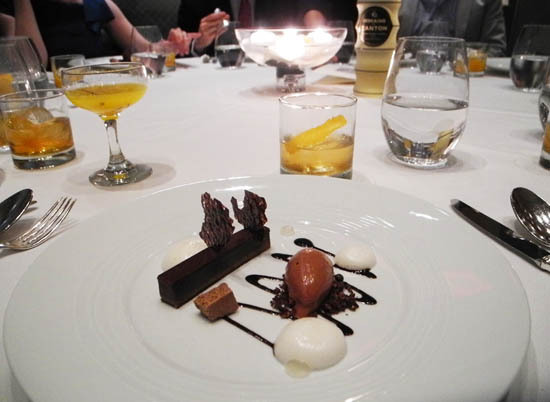 The second dessert was a decadent play on our beloved Dark 'n' Stormy - a gorgeous plated masterpiece of Madagascan Chocolate Ganache, Domaine de Canton Foam, and Salted Chocolate Ice Cream paired with a cocktail of Canton, Armagnac Brandy, Mole bitters, and Demarrera Syrup. As guests chatted at the tables, they nibbled on gingery chocolates and sweets sent from the kitchen, and swirled their cocktails joyfully. As we parted we were all given a lovely bound book filled with recipes, both for cocktails, and cuisine by chef Ripert. A few I'm dying to try: Spicy Hamachi Ceviche with Domaine de Canton, Ginger, and Coconut, and the Oven Roasted Filet Mignon with Domaine de Canton Green Peppercorn Sauce. 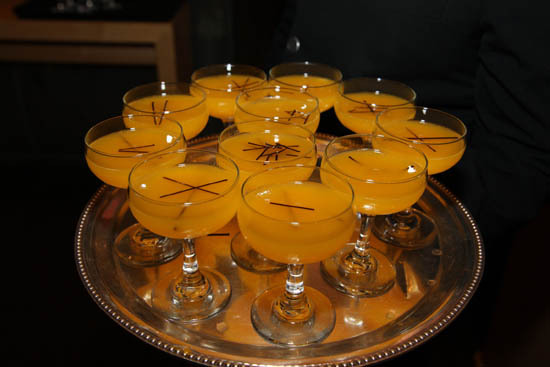 Ginger is a remarkable herb, once a symbol of both wealth and power, known for healing, settling stomachs, being rich in vitamin C, and for being an aphrodisiac, it's no wonder that kings, queens, and other aristocrats adored their ginger liqueur. We leave you with recipes from our favorite cocktails of the evening - and after a few of these tipples, we're sure you'll be feeling like a Royal as well.